One thing is certain, Australia is very, very big and the distances to cover are vast. The Australians like to discuss the weather as much as the English, then Queensland has just had, in our first week here, the biggest cyclone ever - Yasi - with wind speeds up to an incredible 300km/h, with the eye of the storm, at 70km across, bigger than the whole of the last cyclone to hit the area. Queensland was just recovering from massive floods with hundreds of thousands of poisonous snakes and humans all seeking out higher ground. After Yasi, one local, when asked what it was like, said it was 'a bit windy'. Malaria and Dengue fever are now also present in the area. On the other side of the country, massive bush fires, one started by an off-duty policeman using an angle grinder in his shed, have engulfed nearly 100 homes. Meanwhile, our image of the great outback is a red semi-desert, stretching for miles, with kangaroos bounding and emus grazing. After 11 years of drought, the week before we arrived, courtesy of cyclone Yasi, saw a years rainfall resulting in floods and some minor road damage. We had two nights of rain and the outback looked positively lush. Both of us were reminded of Botswana in the rainy season. Thankfully the maximum predicted temperature was 35C in the shade, which meant the walks were open. There are miles between supermarkets, no TV reception, no radio and no mobile phones (Unlike Morocco, where the phone worked in the Atlas mountains). Road signs count you down to each fuel station about 120km apart, there are frequent rest stop areas and you are encouraged by signs stating Fatigue is Fatal to drive for no more than two hours. With the roads stretching to infinity the eyes see it disappear into a shimmering haze, lulling you to sleep. Even with long stretches of straight road, it pays to be careful when overtaking a road-train truck - at up to 150 feet long it can take half a kilometer to get past. A flock of emus appear, strolling across the road; a dingo darts in front of the car, but the road sign which is the most accurate is the one warning of lizards crossing the road. You can be driving along, see what looks like a 3 foot vertical stick, then realize it has limbs and is actually a lizard sunbathing up on its tail.In the outback the lizards grow up to 6 feet long. 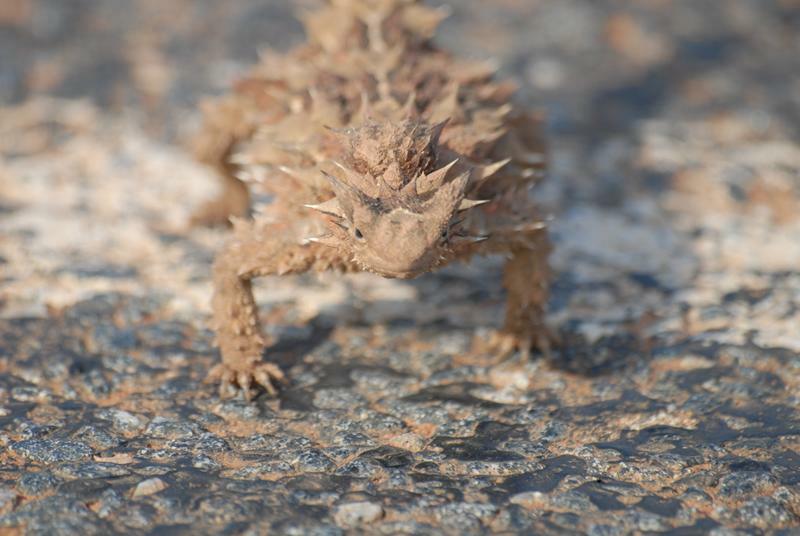 Caroline's favourite is the thorny devil: a magnificent armour plated lizard. 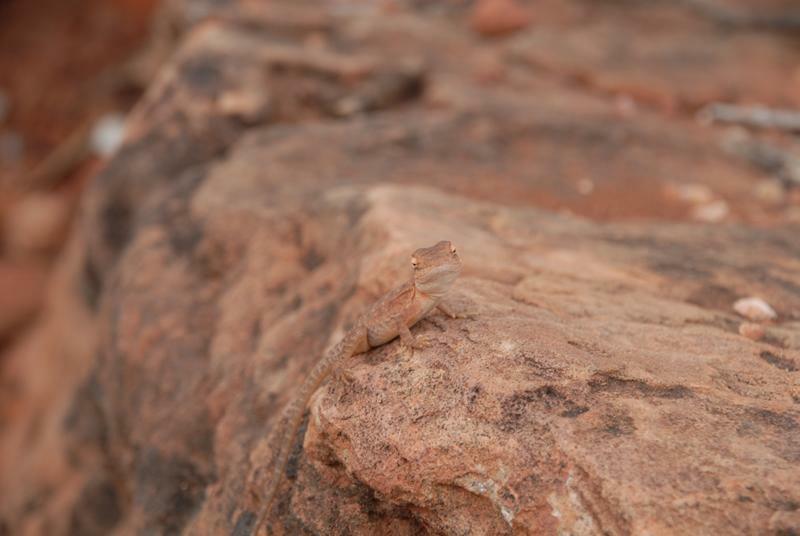 Smaller reptiles include the beautiful dusky pink gecko. The sands show every colour of orange, red and pink. Lakes appear red and the sky pink, not from the sun, but from reflections of the ground. Birds abound, with cockatoos, parrots and even pigeons looking like they have visited a hat stall with feathered quiffs, crowns and crests. At the petrol pump an enormous crow caws in Murrays ear, while pecking at a mouse. Wildlife is everywhere in the bush making driving at night a heartstopping adventure. Owls swoop off the road, clutching their roadkill treats, kangaroos bound across and a dingo darts to the other side. Even the supermarkets provide a treat or surprise. In the supermarket in the mining community of Coober Pedy, 850km from the nearest decent size town, with the staff wearing T-shirts proclaiming they serve the outback mining community, there is a top quality butcher in store, who wraps your meat in brown paper, like the old days. The supermarket at Ayers Rock had a novel use for cake tongs- removal of a very large poisonous millipede, while at Kings Canyon the supermarket had something strange-looking in the freezer. A closer look revealed a large quantity of kangaroo tails - apparently very good for making soup. 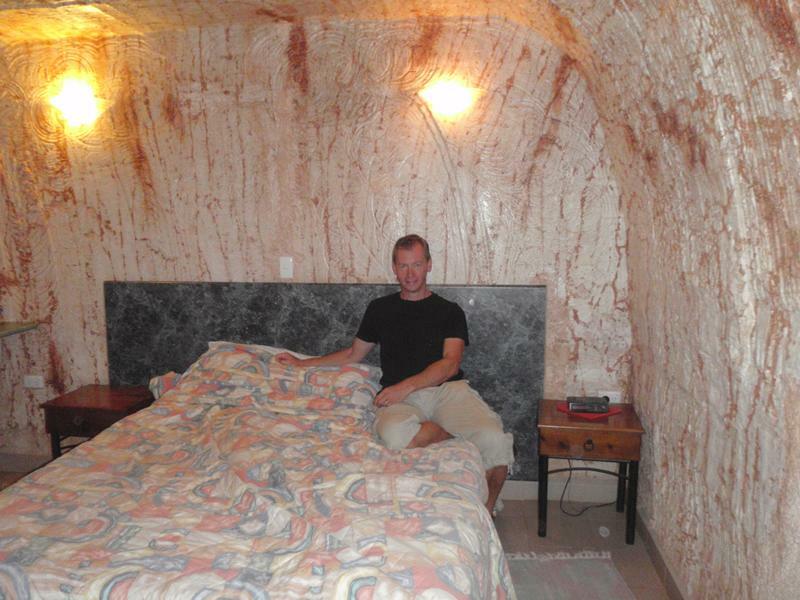 Coober Pedy is in the central region of Australia and temperatures regularly reach 40-50C in the shade, so the early opal miners living there made their homes underground, so we stayed at the main backpackers in a cave room. Driving over the sgtate border into Northern Territory was strange as the insects, foliage density and everything just changes, almost immediately. The NT has horrible flies, they absolutely plague you. Other tourists were sensibly wearing hats with nets - the cliche hat with dangling corks seemed like a good idea more than a corny joke. According to a local, due to unusual weather this year the numbers were far lower than normal - the cull of 6,000 camels a couple of years ago didn't help. Driving north from Adelaide also saw fuel prices increase from $1.23 to $1.77 in South Australia and on up to an incredible $2.06 in one palce in NT. Crossing back into SA, quarantine signs banned imports of plants, fruit and animals. 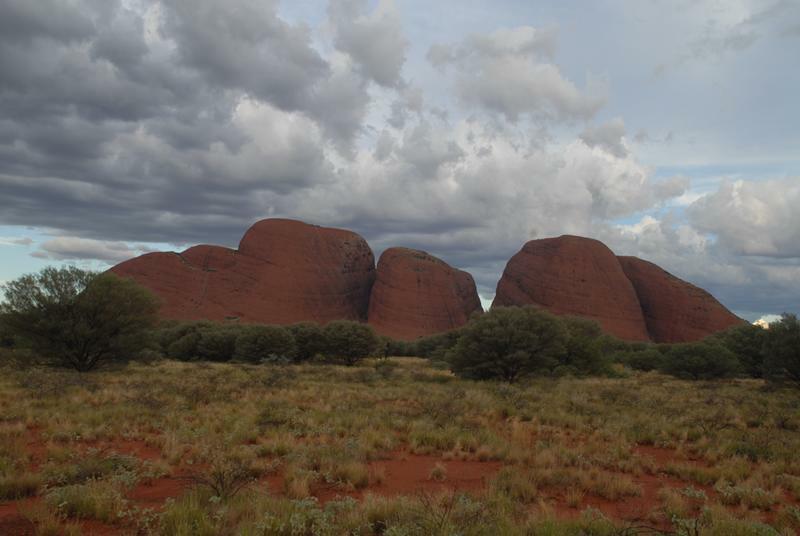 The Olgas, in the same park as Ayers Rock, were fantastic and beautiful, with stunning colours changing as the sun set. 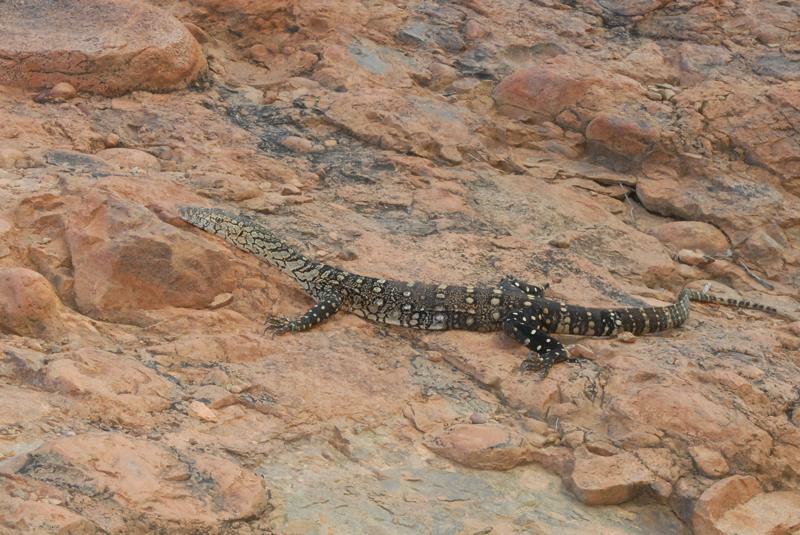 A walk through the gorges produced lizard and several kangaroo sightings. We saved Ayers Rock (Uluru) for dawn the next day, getting up at 04:30 to see the sunrise illuminate the rock, subtly changing the colours and giving the rock the appearance of glowing: definitely worthwhile. At least one person dies climbing the rock each year, and we've been up our share of rocks lately, so we didn't try it. Murray was tempted by the emu, camel and kangaroo platter for entree at dinner, but managed not to succumb. 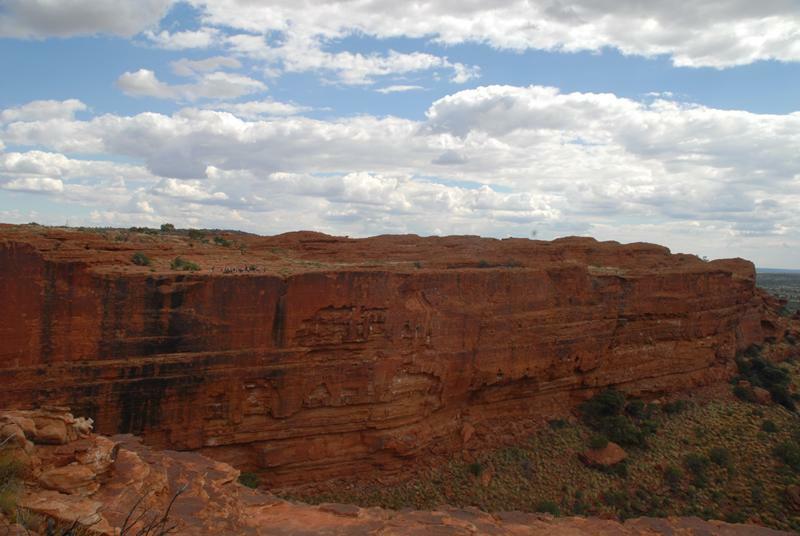 Kings Canyon, home to the elusive quoll, provided a superb walk up the canyon side and around the rim - the pic below has a group of tourists handily placed to provide scale, but like the Olgas we did most of the walk without seeing another soul for most of the hike. The cabin we stayed in provided a new set of warnings- the kitchen had doors 'shut at all times' and the toilet block had gates to keep dingos out. Signs warned that a fed dingo is a dead dingo - it would see the camp as a food source and have to be shot. We loved Kings Canyon and the park swimming pool was great. All round, a knackering, but well worthwhile side trip to the three great rock areas of central Australia. We really enjoyed the 'Red Centre', but drove back south quickly past the area where the Brits tested a hydrogen bomb in the 50's, which is still radioactive and prohibited entry.